Weetabix / Alpen A healthy diet is all about balance – eating more of some foods and less of others. Eating a wholegrain based cereal such as Weetabix for breakfast, which is low in fat, low in sugar and high in fibre, is a big step towards achieving a balanced diet. 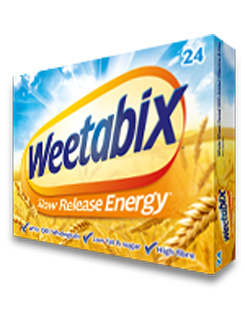 Weetabix is tasty and easy to prepare with cold or hot milk. Weetabix can also be enjoyed with a range of additions such as fruit, honey, jam or chocolate powder. For more info, please visit our store.